As 2018 ends, we recall that a century ago was a time of great change in Ireland. The Irish Parliamentary Party (IPP) goal of Home Rule, an Irish parliament under the Crown, was supported by many before 1916, but Britain’s reaction to the Rising struck them like an Irish Pearl Harbor. The British secretly court-martialed and murdered the leaders who should have been treated as prisoners of war; they unleashed nation-wide Martial Law treating every Irishman as a rebel and Loyalists convinced Lloyd George to break off a piece of Ireland and give it to them. The reaction was predictable – no longer would Home Rule under the Crown do, for now, like the heroes of Easter Week, they wanted total independence. Sinn Fein, an insignificant party, gained strength by defending the Easter Week patriots and by 1918, had four local election victories and became a new political force. Further, many Volunteer units re-formed as the Army of the Irish Republic (IRA) and young women joined a reinvigorated Cumann na mBan. The Hibernian Rifles of the American Alliance folded their organization into the new IRA as the First Battalion, Dublin Brigade. 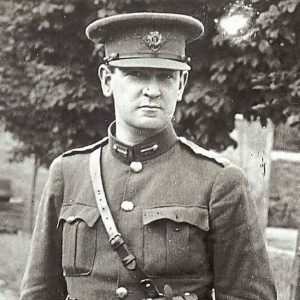 In 1918, Michael Collins, adjutant general of the Volunteers, became Director of Intelligence establishing a network of spies among the police, the British army and even in Dublin Castle – Britain’s control center. His spies intercepted messages and Collins often had them before the intended recipient. In April, a British Report confirmed partition and concurrently, conscription was ordered in Ireland. Reaction saw an unlikely alliance of Church and Sinn Fein rally opposition. As America entered the war, reducing the need for more recruits, and Irish opposition growing, conscription was never enforced. In May, the British blundered again, claiming an attempt by Sinn Fein to import German arms for another rising and arresting 150 of the leaders. The so-called German Plot was found to be black propaganda by Dublin Castle to destabilize growing nationalist sentiment. Collins had warned of the coming arrests and some escaped capture while others chose to be taken to secure a propaganda victory. The internment was significant since it took the accommodating leaders away while militant leaders, heeding Collins’ warning, remained allowing Collins to consolidate control and put the organization on a more military footing. On 4 July, the frustrated British finally banned Sinn Fein, the Gaelic League and Cumann na mBan and forbade public gatherings including GAA games. The Gaelic Athletic Association (GAA), one of the largest organizations in Ireland, had always been nationalist and responded by arranging a program of 1,600 matches at 3PM on 4 August calling it Gaelic Sunday. As many as 4,000 teams with nearly 100,000 players; took the field! The British ended their attempt to dictate to the GAA! By the end of 1918, nationalism had grown considerably and the final nail in Britain’s political coffin was hammered themselves when, at War’s end, Lloyd George called for a December election to insure his continued power. However, an act, passed in 1916 to defuse Republican ire after the botched handling of the Rising, extended the vote to men over 21 and women over 30. This put nationalists in a position to take the country by storm and they did making 1918 a year of profound political change. When the votes were counted on 28 December, Sinn Fein won 73 seats as opposed to IPP’s 6 and Unionist’s 22. The 1918 Election was the last all-Ireland election ever held; it was also the first to allow women to vote; and the first to elect a woman (Countess Markievicz) to the British Parliament. Then, on 7 January 1919, Sinn Fein’s elected members decided not to take their seats at Westminster; instead, they formed their own independent Parliament called Dail Eireann. On 21 January, 24 members of Dail Eireann first met at Dublin’s Mansion House; in a roll call 35 names were in British prisons. They declared Ireland an independent Republic based on the principles of 1916, which led to the War of Independence that fought the Brits to the treaty table, resulted in the 26-county Free State and ultimately to a partial Republic of Ireland! That meeting, 100 years ago, was the most defining moment in Irish history! We’ll visit that meeting next month.